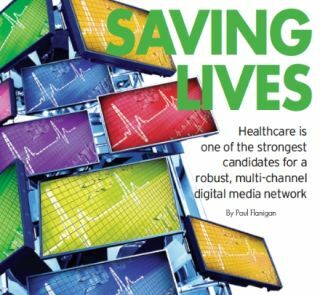 Of all the industries that benefit from information management, healthcare is one of the best candidates for a robust, multi-channel digital media network. The amount of information that passes among hospital administrators, doctors, staff and patients is staggering. Patient information impacts administrators and doctors who can learn about procedures; to pharmacists who work with doctors in supplying the correct medication; to nurses, aides, and interns responsible for attending to patients; and to the patient, the one to which all the information pertains. A digital media network is an incredible benefit, acting as the superhighway for information because of its ability to house and share relevant information as desired. And, of all the industries that must rely on information that is accurate and available, healthcare again sits at the top. The most important thing a hospital can do, from administration to medication to entertainment, is be relevant and timely. It can be matter of life or death that the information the hospital collects and uses is germane to the individual patient and the situation. Two key practices in healthcare have developed through the use of digital media networks. Telemedicine uses telecommunication and information technologies to provide clinical healthcare at a distance, and it is a growing practice in systems with sprawling facilities. It includes clinical aspects, such as videoconferencing among staff and transmission of medical documents for diagnosis, as well as non-clinical uses, such as patient education, Continuing Medical Education (CME) for physicians and staff, and administrative communication. The big factor in this ecosystem of technology is digital media and digital signage, the screens and applications. What makes digital signage an attractive proposition for venues is its control over the network and its ability to seamlessly incorporate various channels. Telecommunications technology over the past few years has had a tremendous influence on healthcare. But the appeal of technology’s capabilities must be matched with the right strategy to implement a network in an information-heavy industry. Simply dropping a screen in a building does not make the system more efficient. A strategy is paramount to learn and understand the details in deploying a digital media network. Hospitals have begun to incorporate resort-style amenities to make a patient’s stay more comfortable. From on-site restaurants to private, multi-room suites for a patient and family, hospitals are now evolving into facilities with a focus on providing a better experience for the patient beyond the procedure. One of the first hospitals to understand that video can impact a patient’s stay was Kaiser Permanente in Roseville, Calif. In 2004, they ran a pilot program in which they showed a video to incoming patients that outlined the details of the their stay. The pilot was so well received that Kaiser Permanente rolled out to all of its locations in 2006. “This video empowers the patient by providing much-needed, basic information about their hospital stay—from acclimating them to their surroundings to providing counsel on where to go for what they need while they are in our facility,” said Dr. Kurt Swartout with Kaiser Permanente. Research has shown that providing education about a procedure to the patient before the patient undergoes the procedure can reduce the patient’s anxiety levels. There are two ways a patient can access information through digital media: active and passive. In the active mode, a touchscreen application can be used, where the education is delivered at the patient’s own pace and comprehension level. The patient can get answers to common questions, learn more about the staff and facilities, and discover what procedures may take place during his or her care. The passive mode can deliver education that may be more general and be delivered through screens in strategic locations throughout the facilities, such as patient rooms and waiting rooms. In addition to reducing anxiety, tailored programming can boost the hospital’s branding as a patient-friendly facility, now a common trait among the most desired hospitals. Dr. Carl Abramson, a chiropractor in Los Angeles, uses digital signage to educate patients about the benefits of and science behind chiropractic. For parents, few things may be more traumatic than taking their child to the doctor. But now, many waiting rooms and examination rooms have evolved into warm, inviting areas designed to appeal to children and reduce anxiety. Digital signage can be placed in waiting rooms, and parents and children can access the screens for entertainment or education. The ability to share information about healthcare can extend beyond the hospital itself. With Web-based, HTML digital signage, healthcare facilities can share their digital screens to outside participants through the Internet by providing a simple Web address. For healthcare facilities specializing in rehabilitation, physical therapy and long-term care, access to the daily events or schedule can generate a key connection point between family members and patients. The waiting room is an optimal opportunity where hospitals can share information to help bring greater awareness and understanding. People in waiting rooms have questions, concerns and a desire for information. When addressed with targeted and relevant digital signage, the content can reduce anxiety, boost the viewer’s knowledge base and reduce the perceived waiting time. Digital signage can provide programming with running times that fit the environment and situation. Instead of 30- or 60-minute programs, the content can be five minutes, or 10 minutes, long enough to engage a viewer, but not too long that a viewer will bore of the program. As a distinct medium, digital signage is not bound by broadcast standards of running time. This is especially beneficial to different areas of hospitals where waiting times may vary. Many people now head to the Internet to learn more about medical conditions and procedures, especially before visiting the hospital. The hospital and staff build stronger bonds with a tech-savvy audience by presenting digital media access and partnering with the patient through the process. The marketability of a digitally connected facility resonates not only with a generation that has grown up around computers, but also with older patients. In late 2011, a study revealed that cancer patients in their mid-60s were much more likely to use Web-based technology. In fact, a tech-savvy hospital can reap rewards. In early 2012, Takoma Regional Hospital in Greeneville, Tenn., was reimbursed $1.3 million in federal money for its efforts to convert to electronic health records. In hospitals, schedules can change by the minute. When events are moved to different locations or times, or something new occurs, the ability to share this information with everyone on-site in a timely and relevant fashion is critical. Imagine a scenario in which a large-scale accident forces dozens of patients to a single emergency room. With digital signage, messaging can be provided not only to the ER but also to all other floors where patients may need immediate care. Instead of hearing about something on the news, the hospital can control the flow of information that is important to the hospital, including any information gathered on-site that gives the staff the advantage of better care once the patients arrive. Any changes that affect the patient, e.g., a surgical procedure moved to another location due to an emergency, can be delivered to the right personnel instantly. When medicine is involved, timing can be everything because delays can affect treatment. Digital signage’s ability to eliminate delays is a benefit to those who rely on timing as a key factor in treatment. Hospitals are no longer single-building facilities. They are sprawling complexes, sometimes covering several hundred acres in several buildings. Two ways in which digital media has grown to bring the patient, the staff and the hospital close is through navigation and telehealth. Interactive, wayfinding digital signage can show the patient the right way to a specific office or specialist. If the doctor is working at another building, the appointment may be changed to suit the doctor and the patient. Wayfinding is often limited only to the immediate location or complex. Doctors and staff are rarely grounded to one building or area, routinely working at various locations within the system. Much like in an airport terminal, digital signage can provide staff with updates on the locations of specialists and doctors at any given moment during the daily schedule. Applying the practice of telehealth, the network of screens, interactivity, and messaging can bring together staff and patients in real time. Digital signage provides a huge benefit to physicians and learning. Digital signage networks that have day-parting control or on-demand features can allow staff and physicians to watch videos on the same network during off hours, reducing the need for additional channels of programming. They can simply tune in the same channel that patients watch when the clinic is closed. The medical field is continually evolving with regulations, laws, forms and procedures around the well being of the patient. Every facet of healthcare is always under scrutiny and very often subject to change. Interactive content delivered by the administration can give staff relevant and timely information as it pertains to the system as a whole. Fund raising has become a major revenue stream for hospitals, especially for non-profit hospitals and facilities that care for large numbers of under- or uninsured patients. In fact, more than $8.2 billion was donated to healthcare facilities in 2012. In state-of-the-art facilities, donors are recognized by being featured on interactive screens instead of plaques bolted on a wall. Screens provide greater visibility to the philanthropic community. Viewers can learn more about each donor and see where the donor’s money may be going. This offers greater recognition for the donor’s activities with the facility. Advertising in hospitals may not only be encouraged but welcome. With advertising on a hospital’s network, restaurants and businesses around the hospital can see an influx of traffic from large healthcare systems. On the other side, hospitals can see a potential financial revenue stream from the right kind of advertising. Because digital networks are almost pure cost centers, justifying their existence may include opportunities for revenue generation. Whether it’s the local eatery, concert hall or cinema, the opportunity to advertise can be a win-win for both parties involved. One of the human errors that digital networks can reduce is misunderstanding from poor communication. Due to their closed-circuit nature, digital signage networks offer a level of control where individuals can monitor and filter every piece of content being pushed out over the network. The flow of information through a hospital system is massive. Trying to create a digital network that can help the system manage this flow, including those who have access to it and those who can deliver it, can be equally Herculean. The appeal of hanging pretty screens everywhere and handing out iPads might trump the strategy of doing it, but the most important thing a hospital facility can do is develop a strategy before any screen is mounted on a wall. There are three core benefits to digital signage in a healthcare facility. The first is access to information. Patients, staff and administration can share and access information that is timely, relevant and valuable to the viewer. The second benefit is relevance. Information can be delivered quickly, efficiently and accurately. When the wellbeing of patients rests in the documentation, the right information delivered at the right time can make a big difference. Finally, digital signage can generate revenue and reduce costs. From the expense of supplies, such as copies, mailings and paperwork, to human resources such as travel, digital signage can turn a globe into a village by centrally hosting all content for any on-demand situation, and it can connect two or more parties together instantly. When appropriated with advertising, many costs may be offset, even to the point where the hospital may see a profit. It’s important to begin with the end in mind: the patient. Since the goal is the wellbeing of the patient, that will affect how you start your project, build your strategy and execute your plan. Yet in the end, the rewards will be substantial because of the effort put into the planning. Paul Flanigan is a seasoned veteran of digital media and regular contributor to Signage Solutions. You can find him at www.experiate.net or on Twitter at twitter.com/paulflanigan.